The Floyd Rose Original (commonly abbreviated "OFR" for historical reasons) tremolo system blew open the doors to loud electric guitar-based music in the early eighties and spawned an endless variety of systems similarly predicated off the concept of a fully-floating bridge with balance against string tension. More often than not, subsequent variations used their own proprietary mounting and body routing patterns. The Floyd Rose Original continues to be produced today and is still favoured by many musicians and builders alike. The design theory was and still is a solid one. The disadvantages of the Floyd Rose Original system are recognised and accepted facts. The pivot points are integral to the body of the tremolo, necessitating either precise machining work or complete replacement of the base plate when the knife edges become worn. The saddle mounting screws lay underneath the string paths, complicating intonation setup work. The radius of the bridge can only be changed by fitting shims underneath the saddles. Strings are retained via the use of clamping blocks which can wear, corrode and seize. Users complain of a "thin" tone, necessitating the use of high-mass aftermarket tremolo blocks made from brass, steel or even titanium. 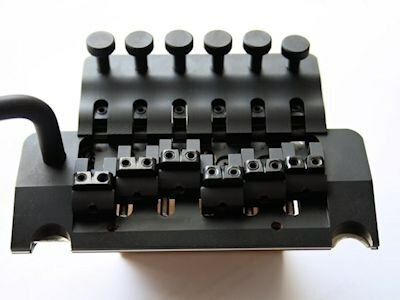 The KATANA 5400 system was created by ABM specifically as a drop-in system 100% to be compatible with fully-floating Floyd Rose Original bridges. On top of that it is engineered to address common issues found in the design without detracting from the things which made the Floyd Rose Original what-it-is. In line with ABMs philosophy of crafting components from "a block of solid metal into a bridge", out of the box it is immediately apparent that the KATANA has not had corners cut with material quality and machining work. Precision-milled from solid bell brass and steel, the ABM KATANA is a surgically-precise modern development on the Floyd Rose Original bridge. As should be expected, string spacing is an exact fit with the original specifications. Floyd Rose Original owners will be excited to learn that each individual string's geometry is fully adjustable in all three dimensions to dial in the perfect setup, all without need for manipulating the trem bar and working around strings. Intonation adjustment is accessible from the rear of the bridge with the only tool required being a screwdriver. Everything else around the bridge is managed using one Allen key, which to ABM's credit is supplied with the system. Releasing the set screw at the front of each saddle unit using the Allen key allows string height and string-to-string spacing to be modified for exact proportional or centre-to-centre string spacing, the former via two height adjustment set screws within each saddle block and the latter by physically moving the block sideways. Re-locking the front set screw ensures that components are both secure and tightly coupled to the bridge system. A common point of wear in the Floyd Rose Original, the hardened steel knife edge of the ABM KATANA is readily replaceable. Two set screws underneath the base of the bridge release this component allowing for fitment of a new knife edge. In addition to replacability, the knife edge also accounts for any width variation in stud spacing when retrofitting a guitar with an existing Floyd Rose Original bridge. Tremolo arm retention is a perennial issue for all tremolo-equipped instruments. An elegant and simple solution on the KATANA is yet another set screw to control the tension of the retaining sleeve. Through this it is possible for the arm to be as loose or tight as desired. Simple and effective. Stringing has been simplified and reliability improved by reducing the angles which strings travel before being secured. Unlike the Floyd Rose method of utilising clamping blocks which turn the strings 90° immediately after the saddle witness point, strings travel straight through the body of the KATANA and thread through the rear without need for any clipping of the string ferrules. Strings are simply secured via set screws at the top of the bridge to prevent tuning issues from string movement. Use of a more compact intonation adjustment method increases the range that the KATANA can bend strings upwards in pitch to around four semitones; Floyd Rose Originals are commonly limited in the upward bending range by the rear string lock screw. For builders incorporating the KATANA into their design, this also allows the size of the top routing footprint to be reduced significantly. Definitely a good thing when you want to remove as little of that awesome top you've been hanging on to as possible! The KATANA is available with a number of options. Finishes include glossy and matte chrome, black chrome and matte black. Custom options available directly from ABM include 24k gold, plus aged and heavily reliced finishes. Alternative brass tremolo block lengths of 37mm and 42mm ensure compatibility with existing setups. Finish-matched locking nuts also milled from bell brass compatible with Schaller R2 (9,5") and R3 (12") dimensions round out a highly-serviceable and highly-specified tremolo system. A full support and spare part service is also available directly from ABM. Despite being designed as a drop-in replacement for the Floyd Rose Original, the KATANA 5400 stands as a highly worthy tremolo system on its own merits. On that basis it should be considered equally as a 21st century hardware choice in its own right rather than merely as an alternative to the Floyd Rose Original which has evolved little over its 35-year history.